I guess when you read this letter you’ll be sitting right here looking at what I’m looking at. The front of Ms. Khang’s English classroom with the old-fashioned blackboard and the posters of the famous book covers and the Thought of the Day and this new thing, this big wooden box painted in bright colors. And if you’re in grade ten this will be your first course with Ms. Khang, which means you don’t know her as a teacher yet either. Pretty weird getting a letter from a total stranger I bet. Or how about getting a letter period, in this day and age…. May I call you Kurl? From what I’ve overheard in the halls and absorbed from the general atmosphere of this school, the nickname “Kurl” is used nearly universally in addressing or referring to you, so I assume you’re content enough with it. You don’t know me of course, but I do know a bit about you by reputation if nothing else…. Jo gets bullied a lot at school. He’s delicate, a musician, a fan of Walt Whitman, and he’s openly gay. This combination makes him a target for a group he calls the butcherboys. Kurl is on the football team, has a permanent scowl, often shows up to school with bruises, and always seems to be getting into trouble. They really could not be more opposite. So when they end up choosing each other’s names as a part of Ms. Khang’s English class letter writing assignment, it takes them both a little bit of time to warm up to each other. Over the course of the year, however, they do find a deeper connection, finding ways make life a little bit more bearable. Kurl is dealing with an abusive parent, a brother who has been to war, a family who doesn’t seem to support any future outside of working for the family business, and, of course, his own emotional and psychological trauma. Kurl experiences elements of PTSD due to the physical abuse from his uncle, and his connection to Jo leads him to examine his own understanding of masculinity, at one point even victim-blaming Jo for bringing bullying on himself because of the way he dresses and expresses himself in public. Jo, though confident in himself in many ways, does not seem to understand the emotional landscape of his life to the fullest, slowly coming to the realization of how deeply the loss of his mother has truly affected him. His sister is also discovering herself throughout the narrative, though this is seen peripherally for the most part, and it does not truly affect Jo until later in the narrative when certain family secrets come to light. Jo, himself, is trying to understand not only his own connection with Kurl, but also how he can finally go about changing his own fate, particularly with regard to the butcherboys and their relentless bullying. As both boys reveal more and more to each other, they end up falling for each other. And although there are many beautiful scenes of emotional and physical connection that take place, their love is never easy, and more often than not leads to some combination of hurt, trauma, and even physical violence. Educators and librarians should be aware of these explorations of PTSD, bullying, and depictions of traumatic events throughout the narrative. It should also be noted that, although each individual comes from a unique background and things like sexuality and class are examined, the book features an extraordinarily white cast of characters, something which should be considered in a time when YA literature in particular is being looked to for more diversity in racial representation. 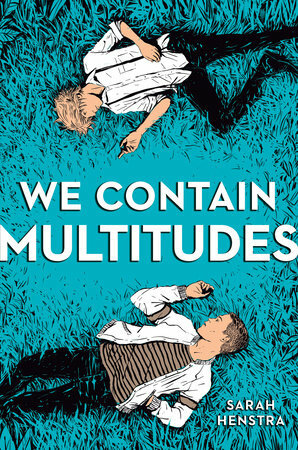 Sarah Henstra has crafted a nuanced text that is heartbreaking, hopeful, poetic, and captivating, creating a literary space for two seemingly disparate young men to forge a bond and discover that they each truly do contain multitudes! Rob Bittner is a Postdoctoral Research Fellow in the UBC iSchool, working with LGBTQ+ representation in young adult and children’s literature, as well as issues around teen readership and access to materials. He has an MA in Children’s Literature from the University of British Columbia and a PhD in Gender, Sexuality, and Women’s Studies from Simon Fraser University.